The personnel section will normally include information on the skills and experience of your management team, and cover your estimated personnel costs. The management chapter starts, like the other chapters, with a good summary. You may want to use that summary as part of a summary memo or loan application document, so cover the main points. Consider what you’d say about your management if you only had one or two paragraphs to say it. Make sure you cover the basic information first. That would include how many employees the company has, how many managers, and how many of the managers are founders. Is your organizational structure sound, with job descriptions and logical responsibilities for all the key members? Is your team complete, or are there gaps still to be filled? Particularly with start-up companies, you may not have the complete team as you write the plan. In that case, be sure to point out the gaps and weaknesses and how you intend to fill them. 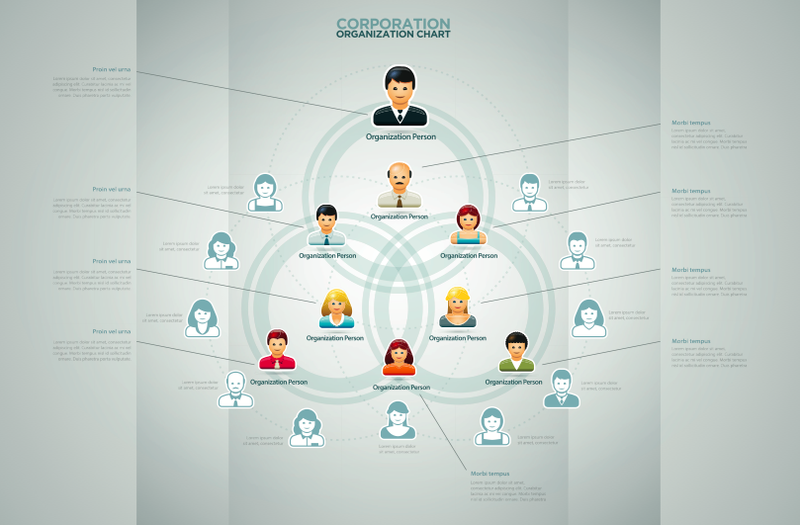 The organizational structure of a company is what you frequently see as an organizational chart, also known as an “org chart.” If you have access to a graphic of an organizational chart (from a drawing program, or one of the specialized organizational charting software packages available), that works really well at this point. If not, you can just use the text to describe the organizational structure in words, without a chart. List the most important members of the management team. 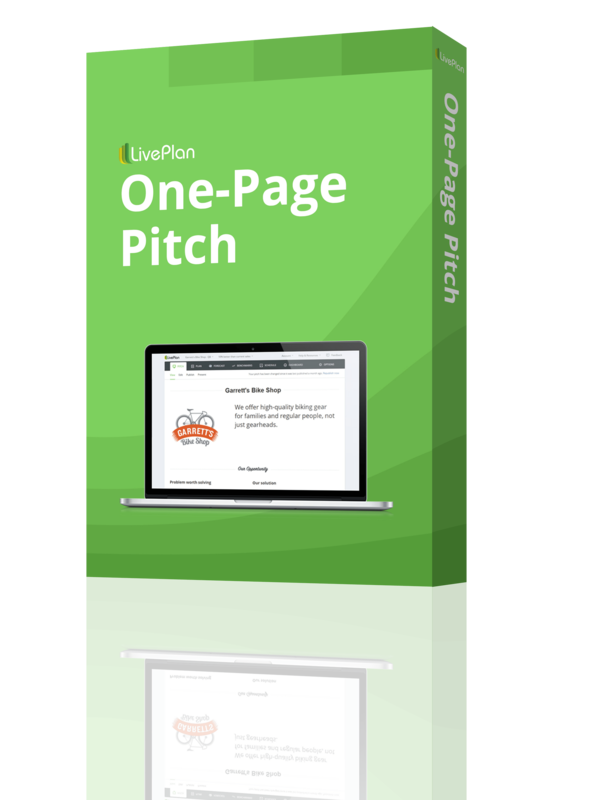 Include summaries of their backgrounds and experience, using them like brief resumes. Describe their functions with the company. Resumes should be appended to the plan. You may have obvious gaps in the management, especially in start-up companies, but even in ongoing companies. For example, the manufacturing company without a production manager has some explaining to do, and the computer company without service has some problems. It is far better to define and identify a weakness than to pretend it doesn’t exist. Specify where the team is weak because of gaps in coverage of key management functions. How will these weaknesses be corrected? How will the more important gaps be filled? Do any managers or employees have “non-compete” agreements with competitors? What do the members contribute to the business? Who are your major stockholders? 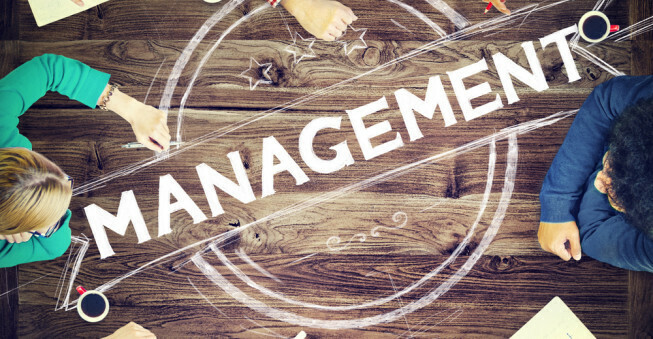 What is their role in management? At this point you should normally include a personnel table to project personnel costs, including direct compensation and indirect costs. The indirect costs include vacation pay, sick pay, insurance benefits, education, and of course, payroll taxes and some other costs. There are different terms for all of this, but my favorite is “personnel burden,” which is a cost over and above the direct wages and salaries. If you are working as a sole proprietor in a home office, you should still include your own compensation as part of your business plan. What you pay yourself should be added into the profit and loss as an expense. However, in this case you don’t really need to include payroll burden, because these additional expenses are irrelevant until you include additional employees. A good personnel plan varies according to your business and business plan needs. You may want a simple list of names, titles, or groups, each of which is assigned a monthly cost. This model is shown in the next illustration. The simpler model totals all payroll only. It is perfectly appropriate for a lot of small businesses. You can use each of the lines in the table to describe specific individuals, or groups and departments. When you have the list complete, just add up the totals for personnel costs in your profit and loss. Multiply that total times your burden rate—say 15 or 20 percent—to calculate your personnel burden. The burden goes into the profit and loss as a separate line. The standard personnel plan is a simple list of names, titles, or categories. The sum transfers into your profit and loss statement. This illustration shows the last three months and first two years of a sample plan. The next illustration shows the more detailed personnel plan that divides the rows into categories, such as sales and marketing, general and administrative, and so forth. The more detailed model shown here totals the planned payroll for each of the four departments, and then calculates total payroll. 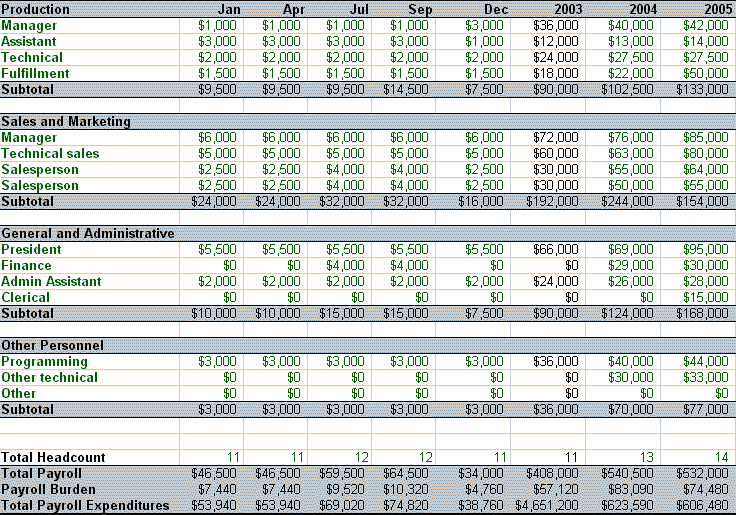 As with the simple personnel table, you also want to calculate a payroll burden as a percentage of the total. Make sure to include the personnel burden assumption in your list of general assumptions. The payroll assumptions in this model will also be used for the other financial projections. The Profit and Loss (also called income statement) will use personnel plan numbers. The more detailed personnel plan shown here divides personnel expenditures into categories including production, sales and marketing, general and administrative, and other.